With Conor McGregor being at the smaller weights, Daniel Cormier views a potential fight with Brock Lesnar as the biggest thing possible right now. Cormier, the reigning UFC light heavyweight and heavyweight champion, is expecting to meet Lesnar in early 2019 after the current WWE Universal champion is cleared. "When there's a fight like Lesnar on the horizon, you don't turn your back," said Cormier during a recent appearance on The Steve Austin Show. "It's the biggest fight in the sport outside of fighting Conor and he fights at 155 pounds. I'm gonna fight Brock." 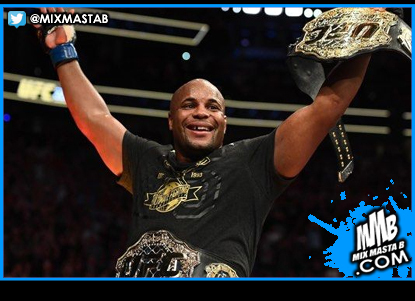 Cormier also addressed former champion Stipe Miocic during the appearance, stating that he feels Miocic deserves a rematch, but "you can't think for a second that if he would have won, he wouldn't have wanted or taken that Lesnar fight."